Also serving communities of Elwyn, Wallingford, Springfield, Secane. There are 26 Assisted Living Facilities in the Media area, with 6 in Media and 20 nearby. The average cost of assisted living in Media is $4,291 per month. This is higher than the national median of $3,346. Cheaper nearby regions include Chester with an average starting cost of $3,090. To help you with your search, browse the 181 reviews below for assisted living facilities in Media. On average, consumers rate assisted living in Media 4.0 out of 5 stars. Better rated regions include Newtown Square with an average rating of 4.1 out of 5 stars. Caring.com has helped 8 families in Media find high-quality senior care. To speak with one of our Family Advisors about assisted living options and costs in Media, call (855) 863-8283. Promotion ends in 2448 days! Located just 13 miles east of Philadelphia on land that once belonged to William Penn, the one-time stop on the underground railroad of Media, Pennsylvania, markets itself as "Everybody's Hometown." With 15 percent of the population being over the age of 65, the community has a lot to offer seniors looking for assisted living facilities. The borough itself is home to six ALFs, with 34 more being located in the surrounding area. As with all ALFs in Pennsylvania, those in Media fall into one of three categories recognized by the state. There are Assisted Living Residences (ALR), Personal Care Homes (PCH) and Adult Foster Care Homes (AFCH). These are governed by the Pennsylvania Department of Aging, the Department of Public Welfare and Area Agencies on Aging, respectively. Each offers similar services, such as help with bathing, eating, dressing and grooming, with the main differences being ALRs are allowed to offer nursing care and an AFCH is limited to only three residents. With a cost of living index 20 points above the national average, Media wouldn't be described as an economical community to live in. For seniors with limited economic resources, other locales might be a better option. The property crime rate in Media is 24.5, 13.5 points lower than the median for the country. However, its violent crime rate exceeds the national average by 11.4 points. For seniors worried about personal security, this could be a concern. Media enjoys a fairly moderate climate. Summer highs run in the mid-80s and winter lows drop into the mid-20s, but the city only receives an average of 12 inches of snow a year, 14 inches less than the national mean. For active seniors, this lack of snow could make it easier to enjoy the outdoors in winter. Media received an EPA air quality rating of 46, a full 12 points worse than the average for the country. For seniors with respiratory or allergy issues, this could present a problem. The city of Media has plenty of cultural activities for seniors to enjoy. The Media Arts Council holds exhibits and classes throughout the year, and The Philadelphia Orchestra, one of America's premier orchestras, is only minutes down the road by trolley. The Media area is home to world-class medical facilities, including Riddle Hospital, in the event of medical emergencies or illness. Assisted Living costs in Media start around $4,291 per month on average, while the nationwide average cost of assisted living is $4,000 per month, according to the latest figures from Genworth’s Cost of Care Survey. It’s important to note that assisted living rates in Media and the surrounding suburbs can vary widely based on factors such as location, the level of care needed, apartment size and the types of amenities offered at each community. 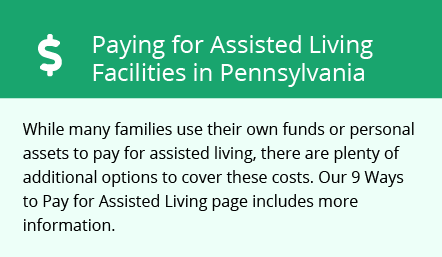 The State of Pennsylvania offers two Medicaid Waiver programs to help seniors pay for assisted living in Media. There is the Community Health Choices (CHC) program and the Pennsylvania Department of Aging 60-Plus (PDA60+) program. For seniors who may need assistance in managing their self-directed services, there is also the Services My Way (SMW) program. Media and the surrounding area are home to numerous government agencies and non-profit organizations offering help for seniors searching for or currently residing in an assisted living community. These organizations can also provide assistance in a number of other eldercare services such as geriatric care management, elder law advice, estate planning, finding home care and health and wellness programs. To see a list of free assisted living resources in Media, please visit our Assisted Living in Pennsylvania page. Media-area assisted living communities must adhere to the comprehensive set of state laws and regulations that all assisted living communities in Pennsylvania are required to follow. Visit our Assisted Living in Pennsylvania page for more information about these laws.